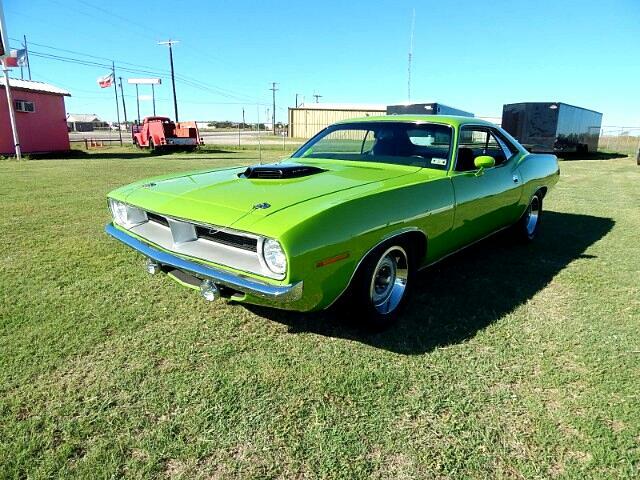 Lone Star Muscle Cars Is Proud To Present This Very Unique And Sought After Cuda'. This car was born a 383 4BB in the Hamtramck Plant In 1970 with a factory four speed transmission. In 2013 This Car was purchased in it's completed state after a total frame off restoration in Whitesett North Carolina. This Car is Powered By A 525 CI HEMI Built By John Arruzza who is a well know Hemi only engine builder. The Block is a World Products cross bolt block, crankshaft is a 4.50 stroke Callies crank. The Bore Is 4.31 with Wiesco pistons,with steel H beam rods. The Heads are MOPAR Stage V Aluminum Heads with 2.375 Intake and 1.900 exhaust valves. The cam Is a hydraulic with 5.75 Lift and 262 duration. The Rockers arms are Mopar Performance aluminum roller rockers. Two Holley 660 CFM Carbs once the motor is up to temp will idle at 800 RPM. The car is equipped with a high volume water pump as well as a large four core Griffin aluminum radiator. The compression is 9.8:1 so you can run this car on Super unleaded pump gas. All of John's motors are pre-run on the dyno and broke in before delivery to the customer. This Motor produces well over 600 H.P. at the Flywheel @ 6100 RPM. To Handel all that power a Chrysler A-833 4 Speed mated to a gear vendor over drive unit so you can cruise at 70 mph with no problem. The Rear End Is a Strange S-60 series with a 3.54 ratio posi and 35 spline axles. To Stop this beast she has Four Wheel Power Disc Brakes. On The Exterior You will see show quality paint in Sassy Grass Green With The HEMI decals all new tires with the correct rally wheels. On the interior you will notice an all new upholstery full rally gauges every thing work even the clock works pistol grip shifter and a nice sound system. This car has less than 3000 miles on it since the build was complete and always kept inside and never driven in the rain. Message: Thought you might be interested in this 1970 Plymouth Cuda.